Published: Dec. 27, 2015 at 03:01 p.m.
Steelers DeAngelo Williams runs in for a 1-yard touchdown. 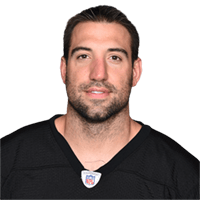 Published: Nov. 3, 2014 at 12:04 a.m.
Pittsburgh Steelers quarterback Ben Roethlisberger throws his 6th TD pass, this time to tight end Matt Spaeth. Published: Dec. 23, 2013 at 05:50 a.m.
(2:00) (No Huddle, Shotgun) B.Roethlisberger pass to M.Spaeth for 11 yards, TOUCHDOWN. Published: Dec. 22, 2013 at 07:30 p.m.
Pittsburgh Steelers quarterback Ben Roethlisberger slings an 11-yard touchdown pass to tight end Matt Spaeth.